Shawn has been working out with Fitdigits Ambassador and Spinning Instructor Giovanni Masi for 2 years now. Shawn attends Giovanni’s weekly Saturday Boot camp at the South Dade YMCA Family center and lifts weights with a friend. Occasionally, he fits in cardio cardio exercise in here and there to supplement his workouts. Just over a year ago, Shawn decided to do personal training with Giovanni 2x a week. In this time, Shawn has made some wonderful changes. He is now down 3 pants sizes and had to purchase a new business wardrobe and formal wear! When Shawn started to run, he was using a Timex Ironman GPR Hear rate Monitor. Two months ago, Shawn ditched the watch and instead began tracking heart rate using Fitdigits on his iPhone. “I am old, fat and slow. I need to get Fitdigits to tell me when I’ve had too many Capt’n Morgans and diet cocktails! I like the real time reporting during the workout so I have a double check if I am really pushing myself or not. I have this tool with me during personal training with Giovanni, while taking his HIIT/TABATA class or out for my daily runs. 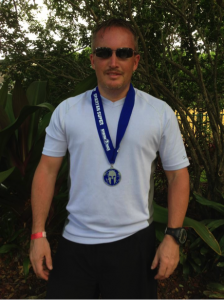 Shawn competed this past weekend in the Florida Spartan Race, placing 47 out of 290 racers in his age division! It’s the furthest Shawn has run/raced at just over 9 miles and 22 obstacles during the challenge. Shawn just finished his first Spartan race with the help of Fitdigits!